Ever wonder what happens to all that money the U.S. and Europeans give to the Palestinians? Well this year for example the Palestinian Authority increased the amount allocated to pay terrorists by $46 million dollars. While most Western countries have laws and regulations prohibiting support for terrorists or former terrorists. In spite of those laws and their opposition, these countries continue to fund the PA’s general budget, thereby paying tens of millions of dollars to terrorists as salaries and other payments. The PA did not cover its 2013 budget without hundreds of millions of dollars from Western donors, tens of millions of which went directly into the bank accounts of terrorists. Since there have been no reports of massive improvements in the PA economy freeing it of the need to receive Western aid to pay its budget, clearly the PA is counting on Western donor money to facilitate this $46 million to terrorists as well. 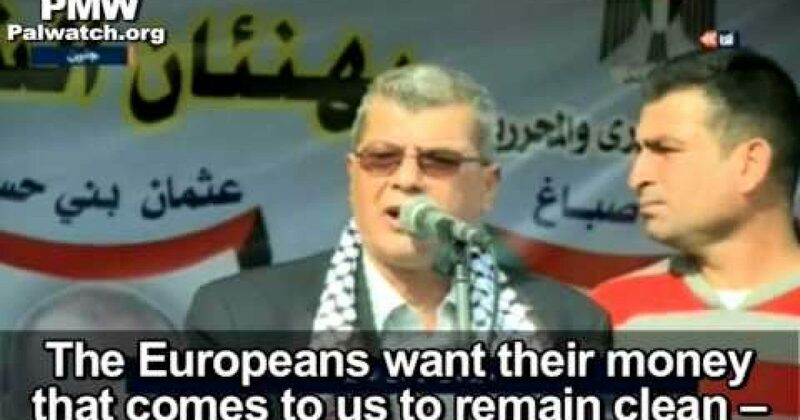 And as the video above demonstrates, the Palestinian leadership is proud of spending our tax dollars for terrorism. These are the “moderates” John Kerry believes wants to make peace.